Michael LeMorin’s music blends the tropical grooves of Brazil and the Caribbean—reggae, konpa, samba, bossa nova—with jazz. Evocative lyrics in French, English, and Haitian Creole speak to both mind and heart. His latest album, Pawòl (Word), is representative of this sonic cocktail. 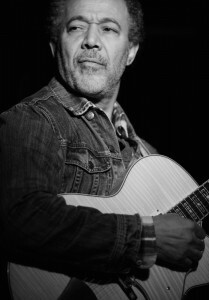 Michael LeMorin Quartet will be playing on January 8 from 7:30-9:30 pm: Michael LeMorin, guitar and vocals; Russel-Madden, tenor sax; Stuart Grant, bass; and Andreas Brade, drums. Join us at the Inkwell Cafe, 408 Rogers Ave between Sterling St and Lefferts Ave. $5 donation supports the musicians and PLG Arts. Check it out here: Michael LeMorin’s music. Food and drinks totally available.